Which Home Pregnancy Tests Are Best? If you are questioning whether you may be pregnant, you can consider using a home pregnancy test before calling your doctor. Deciding on the best one to use, however, can be overwhelming. With so many brands on the market today, it helps to know which is the best pregnancy test with the most consistent results. While blood tests are the only definitive answer to whether you are pregnant, there are several brands of home pregnancy tests that run a close second in providing reliable and accurate results when used correctly. Some brands can be used much earlier in your menstrual cycle than others while others are less sensitive but give clear digital results that are easy to read rather than lines to decipher. According to Dawn Stacey M.Ed, LMHC, a 2004 study published in The American Journal of Obstetrics and Gynecology by Dr. Laurence Cole at the University of New Mexico determined the First Response Early Result test was the only test (out of 18 tests studied) sensitive enough to "consistently detect 12.5 mIU (milli-International Units per milliliter of urine) of hCG" when used properly. This is very important because tests that detect the lowest concentrations of hCG can detect pregnancy earliest, and most tests pick up concentrations between 20 and 40 mIU of hCG. First Response Early Result is considered one of - if not the most - sensitive tests on the market. 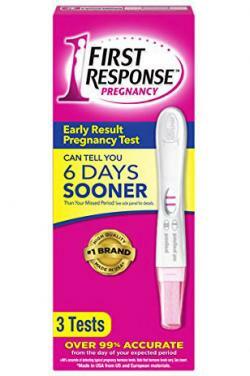 It is the number one selling pregnancy test by First Response and was voted Best Pregnancy Test and a "Mom Must Have" by pregnancy and childbirth resource site What to Expect. It's also the number one test chosen by educational site Check Pregnancy for accuracy and sensitivity. The First Response Early Result test comes in a 3-pack and is available online and in retail stores for approximately $13.00. The Bump recommends the New Choice Pregnancy Test for potential moms who need to be sensitive to pricing. Their choice is based on positive user feedback on their active message boards for new mothers. Despite its low price, it has an accuracy level that performs better than many more expensive tests. Its sensitivity to hCG levels is in the highest percentage compared to other tests. The test can be found at Dollar Tree stores for $1 and online for approximately $8. Each package comes with a plastic holder and a dropper for placing urine samples within the holder. 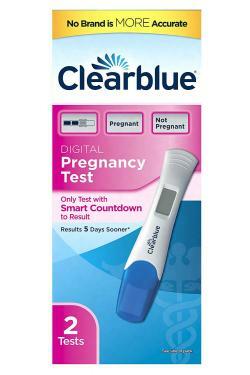 The Clearblue Digital Pregnancy Test with Smart Countdown is also a reputable choice. It is not as sensitive as the First Response Early Result kit, but the manufacturer claims that positive results can be read as early as five days before a missed period. The manufacturer also claims testing has shown that it is over 99 percent accurate from the day of the expected menstrual period. Its easy-to-read digital interface and a simple "pregnant" or "not pregnant" reading in the result window makes this an excellent choice for people concerned about reading the results incorrectly. An additional perk of this test is the urine stick turns pink if it was used correctly. This helps determine if the test was held in the urine stream long enough and leaves less room for error. The test is considered one of the most reliable home pregnancy tests, and Walmart reviewers give the test 4 out of 5 stars. The test is available in a 2-pack for approximately $10. If you're not sure you're pregnant but are in the process of trying to become pregnant, buying several pregnancy tests can get quite expensive. The solution is Wondfo Pregnancy Test Strips. Very Well Family lists Wondfo strips in their top 8 home pregnancy tests, and the Bump calls it the "best one-line pregnancy test." The test contains paper strips that look like swimming pool or aquarium water testing strips. All you need to do is urinate in a cup and dip the strips in and after five minutes, two lines will appear that indicate you are pregnant or one line if you are not. The manufacturer says the strips are sensitive enough to detect 25mlU/ml, and Countdown to Pregnancy site gives the Wondfo strips 4 stars out of 5 for accuracy compared to other brands. Wondfo Pregnancy Test Strips come in a box of 10 for about $8, 20 for $9 and 25 for about $10. While there are many brands and types of home pregnancy tests to choose from, rest assured knowing that these four consistently come out on top based on your individual testing needs. Keep in mind that the only definitive pregnancy test available comes by calling your physician and having your blood drawn to detect the hCG hormone. Until you can do this, however, at-home pregnancy tests are still a valuable tool when you want an earlier answer. Before you head to the store, though, it helps to understand how home pregnancy tests work as well as how they can be inaccurate.